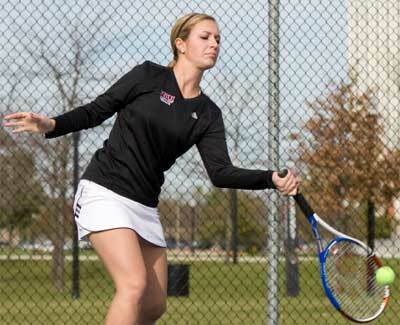 The Northern Illinois women’s tennis team picked up its second Mid-American Conference victory on Saturday by taking down the Ball State Cardinals 4-3 at the Cardinal Creek Tennis Center. Sophomore Haley Dekkinga (Allegan, Mich./Allegan) came up clutch against BSU, winning her singles match in three sets to clinch the win for the Huskies. Dekkinga defeated Kylee Johnson 3-6, 7-6 (3), 6-2 with the overall match tied between both teams at three points apiece. This was also following a loss in doubles play earlier in the match. With the victory, Dekkinga clinched her 12th singles W of the season, and her 24th combined match. Also picking up victories for NIU were freshmen Nelle Youel (Crystal Lake, Ill./Crystal Lake Central), Mary Malkin (Tel Aviv, Israel/Alliance), and Stephanie McDonald (Harare, Zimbabwe/St. Anne’s Diocesan College). With the win, Malkin notched her 10th singles win of the season, making her the third Huskie to accomplish the feat this season. Nelle Youel joined Dekkinga with her 24th W on the season as well as her 14th singles win. The senior tandem of Sara McLaughlin (Moline, Ill./Moline) and Emily Rogers (Rochester, Minn./Century) grabbed the lone doubles win for the Huskies, winning 8-2. NIU will wrap up the season with back-to-back home matches against Akron and Buffalo. The Huskies face the Zips on Saturday, April 21 at 1 p.m. on the West Tennis Courts in DeKalb. The team will follow it up with senior day against the Bulls on Sunday, April 22 at 1 p.m.
For more information on NIU women’s tennis and Huskie athletic, visit www.niuhuskies.com.